Long ago I hacked a little script to create complete image series with xplanetFX. 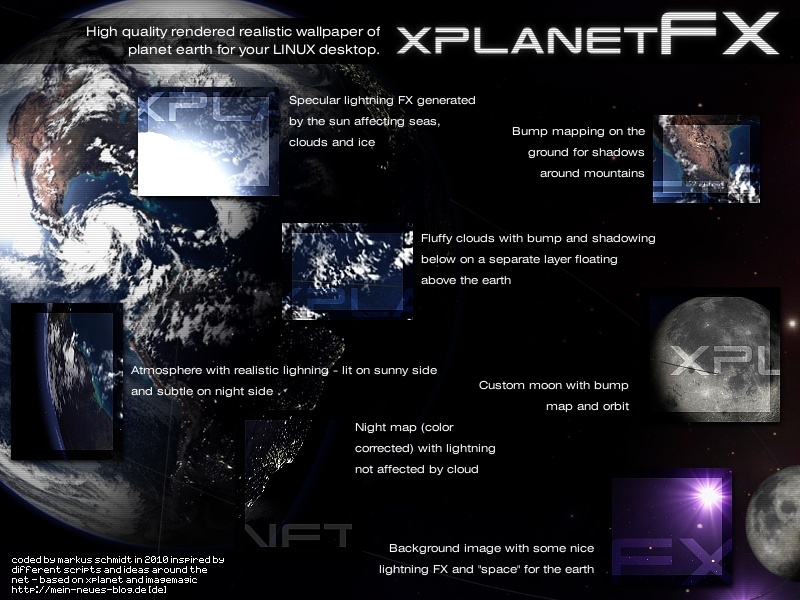 It can be downloaded from here: xplanetFX_series. …and creates a bunch of images in the directory the script is lying over 24 hours with a gap of 10 minutes. Needs Python and Zenity (or KDialog in KDE), default in Ubuntu. Kdialog can’t do progress bars and I don’t hack dcop-support 😉 so in KDE it’s kind of uncool. Everything else reports to the terminal. This article is just a translation to english to get linked from the main xplanetFX page. This article was published Samstag,, 30. Juli 2011 @ 21:51. You may want to subscribe to the comments via RSS 2.0 feed. Post a comment, or create a trackback on your page.